On 20th February 2018 Dr Simon Stringer gave a presentation at The Royal Society Symposium on Understanding Images in Biological and Computer Vision. The title of Dr Stringer’s presentation was entitled The Emergence of Polychronization and Feature Binding in a Spiking Neural Network Model of the Primate Ventral Visual System. The presentation described a new approach to solving the classic feature binding problem. 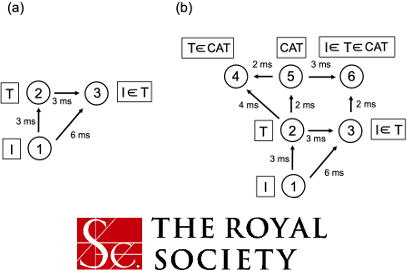 This problem concerns how the visual brain not only represents the hierarchy of visual features within a scene, such as a vertical bar, letter T and the word CAT, but also the relationships between these features at every spatial scale (Figure a, b). A paper based on the presentation was subsequently published in The Royal Society Journal Interface Focus, and can be downloaded here. 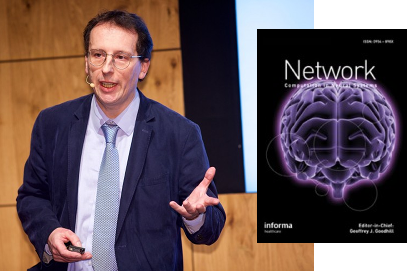 Dr Stringer has been appointed as the new Editor-in-Chief for the journal Network: Computation in Neural Systems. The official announcement on the journal's website can be found here. Dr Stringer has introduced the following new revised scope for the journal. - Neural network computer modelling of all aspects of brain function. - Analysis of experimentally recorded neural & synaptic dynamics underpinning brain function. - Neural & synaptic mechanisms and emergent network dynamics underpinning psychiatric and neurological disorders. - Experimental and theoretical investigations into the neurobiological basis of consciousness. - Applications of biologically-inspired neural networks in artificial intelligence. - Neural network approaches to artificial general intelligence and machine consciousness. We join the publishers Taylor & Francis in welcoming Dr Stringer to the journal and wish him well as Editor-in-Chief. Do get in touch with Dr Stringer if you are a researcher interested in submitting to the journal or participating on the journal Editorial Board. 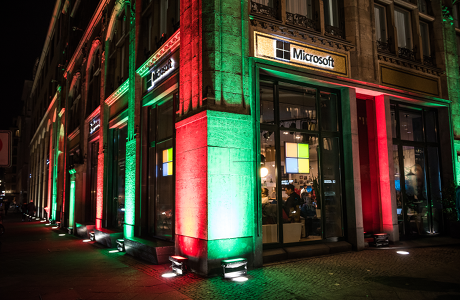 On 16th November 2017, Dr Simon Stringer was invited to speak at the Microsoft <Explained> Conference, which was held at Microsoft Berlin. 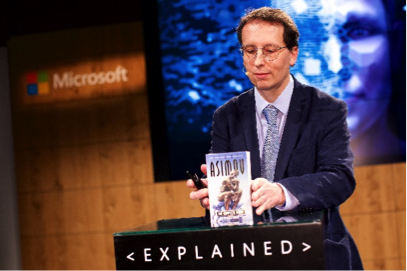 He discussed how the robot stories of Isaac Asimov have inspired generations of engineers, but that these sentient machines still remain in the realms of science fiction. Dr Stringer then spoke about computer modelling of the brain as a path to the development of Artificial General Intelligence (AGI). In particular, he described how our latest generation of biological ‘spiking’ neural networks has provided a way to solving the classic feature binding problem in visual neuroscience. This problem concerns how the brain is able to represent the relations between visual features at different spatial scales within a scene. Solving this is a key step towards enabling future machines to make sense of their visuospatial world. 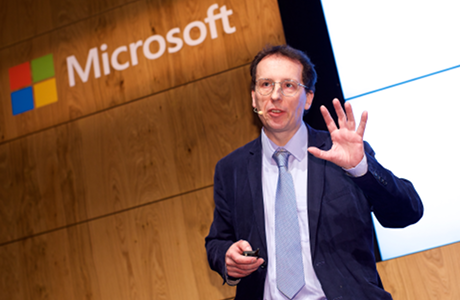 Below you can see some highlights of Dr Stringer's talk at Microsoft Berlin. 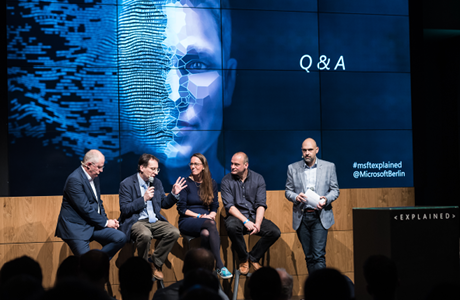 Microsoft <Explained> Conference brings together lead scientists and Microsoft representatives to discuss the opportunities and challenges that new technologies and platforms offer to us - from AI and Machine Learning to Quantum Computing and Blockchain! Dr Stringer described how our latest generation of biological ‘spiking’ neural network models provide a way to solving the classic feature binding problem in visual neuroscience and how computationally modelling the brain can be the path to the development of Artificial General Intelligence. Artificial intelligence is transforming our world. Fast. The Playfair AI Summit 2016 explored the frontiers of AI research and how these technologies are leveraged by companies to extend the functionality of products and services, as well as enable entirely new ones altogether. Conversations were led by the industry's most respected journalists and thinkers. Dr Stringer was invited as one of the brightest academic and entrepreneurial leaders in engineering, research, product development from the most exciting technology companies and Universities. You can watch Dr Stringer's talk below. The Foundation is developing a variety of commercial applications. One of these projects aims to develop technologies to look after elderly people living alone or in care homes. You can watch the video below to find out more. Dr Simon Stringer is interviewed on BBC World News about future developments in computer modelling of the brain and artificial intelligence. Dr Stringer leads the Oxford Centre for Theoretical Neuroscience and Artificial Intelligence, which is based within the Oxford University Department of Experimental Psychology. Members of the Oxford Centre for Theoretical Neuroscience and Artificial Intelligence gave a lecture entitled ‘Age of the Machines’ at The Royal Institution in September 2014. The event was organised and sponsored by the asset management firm CQS with additional support from the foundation. The lecture was introduced by Sir Michael Hintze, founder of CQS, who discussed the current trends and the potential future impact of artificial intelligence and robotics in manufacturing, business and society. Dr Stringer described current technical challenges in artificial intelligence and robot control, and discussed how these challenges might be met by advances in understanding brain function. Dr James Tromans and Dr Daniel Walters discussed their work developing computer models of visual and spatial processing in the brain, respectively. While Juan Galeazzi presented simulations of a new model of animal behaviour that had been developed by Harry Jordan. Dr Stringer concluded by discussing the possibility of creating machines with artificial consciousness. A video of the Royal Institution event may be seen below. Meet the Team organising such events!